Due to this, council called a special meeting to discuss the item on Jan. 14 with one portion of it being open to the public and the other in closed session. With a deadline to apply on Jan. 16 and 25,000 acres available for new development on dryland quarters, councillors discussed if they wanted to move forward. The lands in question are primarily located in the Retlaw area and all are M.D. owned land. While the contact was made, administration saw the responses to be theoretical due to a lack of available details. One of those details was soil testing which is needed for all quarter sections to determine suitability for irrigation and would be the first step if council elected to pursue the conversion. If leaseholders were expected to cost share in the development, rent would approximately be $150 per acre. Higher rents may be achievable if subletting was permitted by the M.D. with annual rental revenue would range from $331,500 to $422,000, dependent on how lease terms were specified. Concerns expressed by leaseholders have been around rent increases and lease contract lengths. Geremia asked about the possibility of having the M.D. buy the water rate with the farmers building the infrastructure, which council said was a possibility. While soil testing may prohibit some lands from converting, Coun. John Turcato also pointed out some of them may have tough geography to navigate which would also hinder the conversion. With subletting an option M.D. council was okay with, they also wanted to make sure there were some guidelines in place in case leaseholders went down that road. Other councillors agreed a rotation would have to be approved if subletting was going to be used. There still was some concerns about going forward from council as the projected cost was around $8.2 million. With funds coming from debentures over an estimated 20-year term, a concern brought forward was whether the project would be worth it. “If it is going to take us close to 20 years to pay for it, that seems like a long time for a return on investment. Heaven forbid, if we try to auction everything off like the BRID did, it means we have to break leases and I don’t want to see that. On top of that, to do anything with our land is a pretty big deal and it is all of the resident’s land, too. There are only seven of us and I feel more residents should have a say in what they would like us to do. This is a big decision and shouldn’t be rushed,” said Coun. Leavitt Howg. The first resolution was for water rights for 13 dryland quarter sections, the second was for tame grass water rights on four quarter sections and the final was a water right application for one-quarter section. Council made a motion to advertise the M.D. has applied for water rights on the website and media sites which were carried. 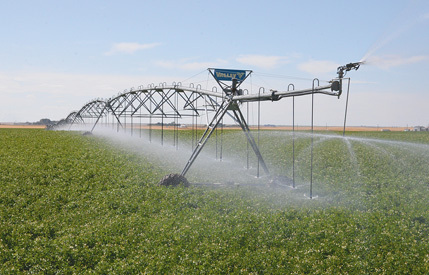 They also made a motion to request the director of municipal lands and leases to determine costs pertaining to irrigation development and provide financial information to council pertaining to total costs per quarter and debenture information and was carried by council.